Hook’s Heroes is a Video Slot that will make many of us think back to our childhood, when we had dreams of staying young forever. That’s because, of course, the games centred around J.M Barrie’s “Peter Pan” novel, which became one of the best-selling books of all time, adapted into numerous movies, and children’s books. 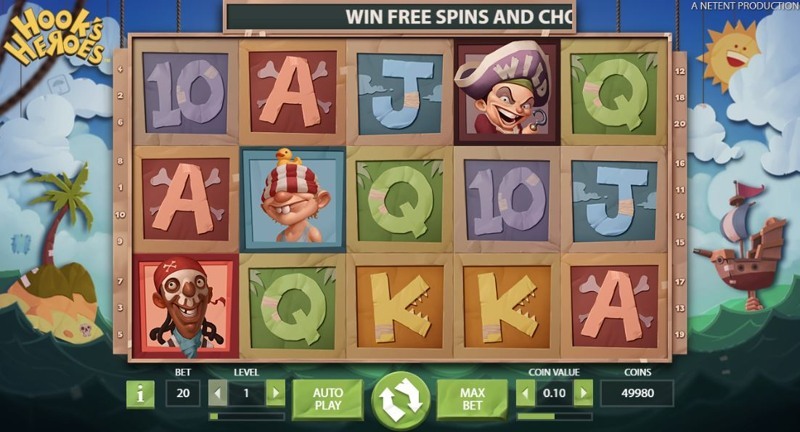 While Hook’s Heroes – a new Video Slot from Net Entertainment – doesn’t follow Peter Pan as such, it does follow Captain Hook, one of the main villains from the book, and Net Entertainment have managed to create a fantastic game, both in terms of gameplay, and wins. The game is structured using typical Net Entertainment slot ‘formula’, with 5 reels, and 30 fixed pay lines. The game controls are beneath the game, as usually, with an “Auto Play” function, “Spin” button, and “Max Bet” button at the centre of the design, with bet adjustors and information buttons either side. The overall design of the game is fairly unique, and Net Entertainment have opted to use a cartoon-style to display both the reels and the background. 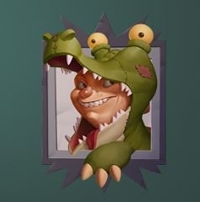 While this is a risky choice, the development team at Net Entertainment have pulled it off fantastically, and the game looks great, is smooth to play, and is also built to run on mobile devices, meaning phones and tablets can enjoy the Hook’s Heroes action, as well. In terms of symbols on the reels, you’ll find the low-paying playing card symbols, as well as the game specific symbols, which includes a variety of characters from the novel. If you land two of the scatter symbols in view during the base-game, you’ll receive a free-spin with either the Fairy, Mermaid, or Pirate Feature activated for that spin. The type you receive is random, and lasts for one re-spin only. 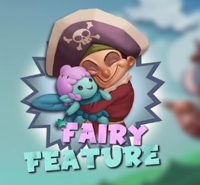 Choose the Fairy Feature, and you’ll be awarded 7 free-spins, with 2-5 wild symbols randomly added to the reels, for the duration of the feature. 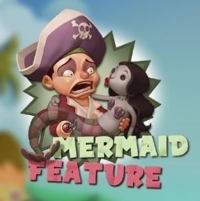 Choose the Mermaid Feature, and you’ll get 10 free-spins, with all wins subject to a 2X multiplier. Plus, wins that use a wild symbol benefit from a 4X multiplier. 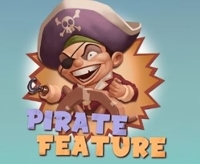 If you choose the Pirate Feature, you’ll receive 15 free-spins, with all symbols acting somewhat like “scatter symbols”, meaning you only need to land three in view to secure a win. Interestingly, if you land 4 or 5 of the scatter symbols in the base-game, instead of receiving extra spins, or a monetary prize, you get to play the bonus 2, or 3 times, respectively, and after each round, you can pick again which feature you want – a really nifty feature.